RELEVANCE: Late 1950s nuclear space propulsion Project. 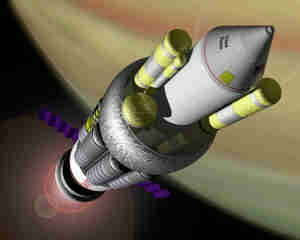 DESCRIPTION: Project Orion was the study of a propulsion concept involving nuclear explosions. The proposed Orion Spacecraft would have contained a nuclear pulse drive, which worked by sending small nuclear bombs to explode behind the ship, blasting it forward an extra 12m/s per detonation. The Project Orion ship would theoretically be effective for interstellar travel, allowing for four week trips to Mars, as opposed to the roughly nine months it would require via current methods. However, logistical and ethical concerns have prevented practical application. The project ended with 1963’s Partial Test Ban Treaty, ending nuclear weapon tests in the atmosphere, outer space, and under water.